London cabbies and residents alike have been growing increasingly upset by the designated Olympic lanes that have been created throughout the city. Protests have been staged and complaints cannot help but be heard. The city is already difficult to navigate and the roads are often congested with traffic. The reason for the creation of Olympic lanes is specifically for use by Olympic athletes, dignitaries, journalists, and other officials attending the games. The reason for complaints is that nobody else can use these lanes besides those involved with the Olympics. Residents complain as it has become increasingly difficult to move around the town. But cabbies have a stronger argument. It is making their job nearly impossible. They claim there are various parts of their routes where they can’t stop on the left to either drop passengers off or pick them up. There are even many parts of London itself that have become inaccessible. This obviously raises concern for cabbies to be able to do their job effectively. In some areas, these lanes cause major traffic jams and it’s known that it doesn’t take much to bring the aging infrastructure of the capital to a halt. The Olympic lanes cover 60 total miles of road throughout the city. If a cabbie is found driving or stopped in any of these lanes, they can be fined up to $200. There are some that believe the London taxi was an iconic image used to secure their bid for the Olympics, and its scandalous that the government would then turn around to deny cabbies access. In a sense, it was false advertising. Another interesting point is that several athletes became lost on their way from the airport on a sponsored Olympic Bus. 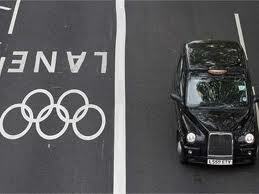 The driver was unable to find the designated Olympic lanes. So the question is then asked, would this have happened had those lanes not been available and whether it will happen again in the future. It’s yet known if these special lanes will confuse drivers to the point that they will be unable to find their way. If that is the case, then perhaps the lanes were a bad idea. Londoners from all corners have different thoughts on the worthwhile of the games being held in their city. One issue is that the security arrangements made for the games were botched. The government was forced to call in thousands of extra troops and even ask the American TSA for help. Others feel that the games will be stalled or held up by various labor protests on the part of governmental staff. There is no better way to be heard than to slow down the biggest game in the world. There are those that are complacent that they cannot afford or find tickets to the games in their home country as well. Some parents are even complaining that their children cannot get to school on time due to these lanes. The same goes for workers who have to commute, at times they literally have to get off and begin walking, as that’s a faster means of transportation. So it would seem that before the games have even begun, the problems are becoming clear. Once the games do begin, the extent at which these lanes affect Londoners may grow out of control. At this point, all that can be done is to wait and see. It’s almost guaranteed the Olympic lanes will remain and Londoners will have to endure until the games are over. If protests continue, it is going to compound the problem even more. Which will only cause additional congestion, as more roads are help up by protestors and the disgruntled. There are those that believe the Olympics is the greatest show on earth, while other Londoners claim it is nothing more than an exalted track day. Either way, the London Olympics are going to be quite interesting this year. But whether London can handle the influx of people and traffic is yet to be known… only time will tell. The author of this article is Damien S. Wilhelmi, an SEO savant and content marketing self-acclaimed genius. You can follow me on twitter @JakabokBotch. I am writing on behalf of AAMCO Colorado, who specializes in transmission repair and offer competitive transmission repair prices.